3 Famous Sites in a day -- Only in Puerto Princesa! Our Hunda Bay tour was a whole day affair. We got picked up at the Pension house at around 7 am, and was able to reach the Hunda Bay Tourism Board at around 8 am. So after our guide registered us, we boarded on an outrigger boat with 2 other pairs. We got to the Pambato Reef site around 8:40 am. So as soon as we docked, we geared up and dove into the water. During our snorkeling escapade, we were able to see a lot of beautiful corals and a variety of fish. 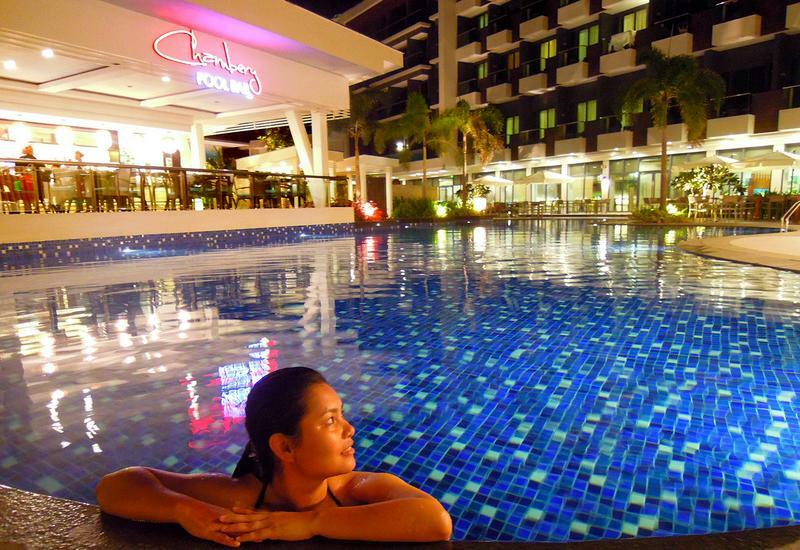 You can just imagine how amazing our morning swim went after seeing different kinds of fish. On our way to our second site, our tour guide asked us why our second destination coined the name 'Snake Island'. The tour guide didn’t tell us the reason just yet. So we were left wandering. My first thought was that it was initially inhabited by snakes, which freaked me out a bit. And as we were nearing the island, the guide finally told us the reason behind the islands strange label. I was actually relieved when I heard that the island had the shape of a snake when seen on a birds eye view. It was just that. Anyway, the island was also filled with a bunch of amazing fishes. One even had a good bite out of me. They also named this particular fish as the ‘Territorial Fish’. Indeed, it was. Rubel and I had a good time feeding different schools of fish. We even saw a bunch of Nemo’s under water (Clown Fish). 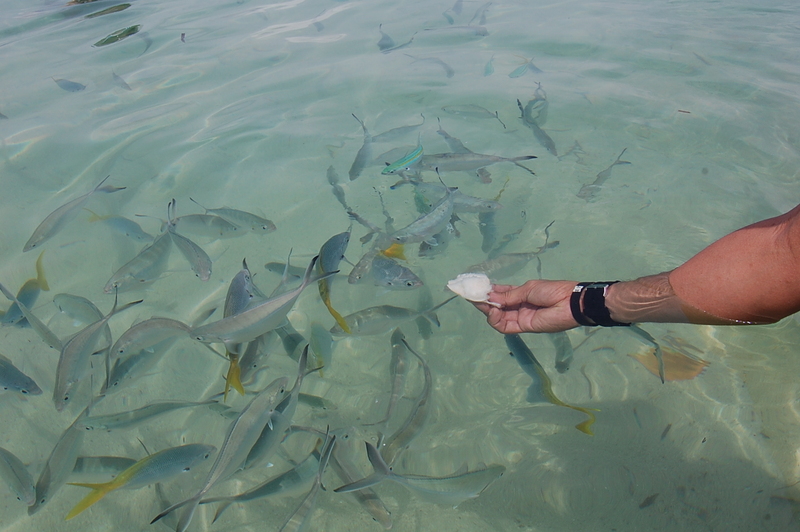 Anyway, after feeding the fish, we were called back to shore to be fed with real food. =) We had our lunch (buffet-style again) by the beach. Now the nice thing about being on this island was that you'll be able to see so many Starfish (in varied sizes and colors). 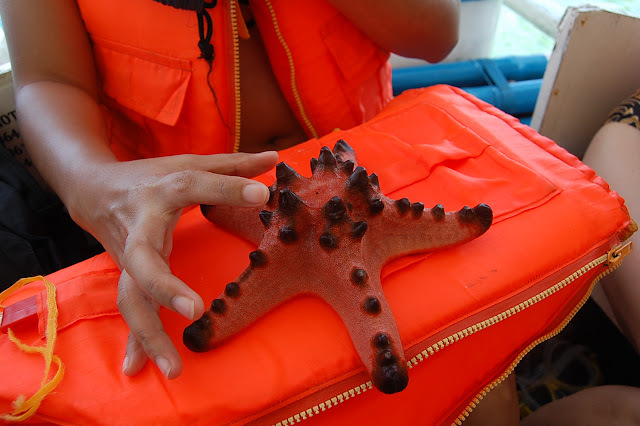 The one Starfish that I was really amazed with was the large pink and plue ones. Since those weren’t allowed to be taken out of the sea for long, we were only given a few minutes to take pictures with it. The starfish were then thrown back to the sea afterwards. After lunch and a few minutes worth of strolling and picture-taking, we were asked to board the boat again. 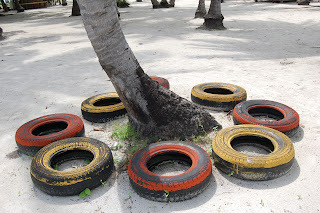 Pandan Island was our last destination for the day. Pandan Island had a lot of fish as well, especially smaller ones. Since we ran out of bread to feed the fish, Rubel and I just decided to observe the sea creatures. Back in town: Puerto Princesa! We had a great tour, all in all. We actually got back at the port by 4 PM. And since we were too tired to go elsewhere, we just decided to hit the food place nearest to us, which was Kinabuch’s Bar and Grill. 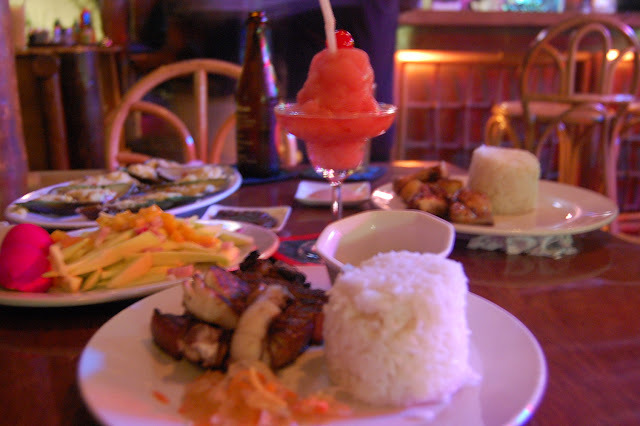 We ordered some grilled liempo, green salad mango, baked tahong, and for me --- a strawberry margarita! We ended the night with a few more beers, and then headed back to Puerto Pension to do some last minute packing. We weren’t able to hangout by the Tribu Deck anymore since we were so beat from the day trip that we had. Puerto Princesa was by far, the best local place that I’ve been to in a while, and Puerto Pension made our stay even more enjoyable. So we’re definitely going back! How fun! Would love to Nemo in his natural habitat, not in an aquarium or animated film. :)) That starfish is also a star as much as Nemo cuz of its size and colors. Awesome, I kind of traded this Honda Bay Tour off since I got no time when I visited here..
Will definitely catch up, I was surprise though that there is only 3 locations for this trip. I have friends and relatives there, so one day I should make the trip before I get too old to travel. envious!!! for now i will just have to be content with the stories and photos posted in blogs... let me visualize snorkeling and seeing nemo! lol! 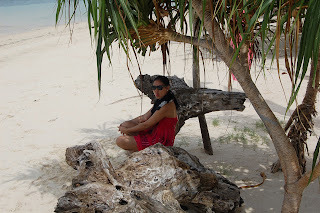 I love the school of fish at Hunda Bay but I love Bohol's Balicasag Island marine sanctuary more! Aww nice to see Honda Bay! I lost all my pics during my trip there in 2006, and though I've been back in Palawan a number of times, I haven't gone back yet to Hunda Bay and wanting to do it this year so thanks for the post dear! Hindi namin natry ang Honda Bay Tour ng pumunta kami sa Palawan..
May dahilan para bumalik.. hehehe.. Thanks for the link on your travel expenses (it helped a lot for frugal peeps like me) and of course, the pictures you shared as well. hehehe! You should try it sometime, Ms. Gemma. :) What's holding you back from planning a trip like this? Really? When I had a few on top of my legs (while taking photos), these creatures didn't even budge one bit.. hehe. psstt. depends on my sked... inform me ahead of time... workaholic ako LOL! this is one destination my husband and i are looking forward to visiting with the kids, of course. Hello dear! The excel file for the Travel Expense Sheet seems to be working fine on my end. I was able to open it right away. Would you like a copy perhaps? Just email me your address at mai.wanderluster@gmail.com -- I'll email you a copy as soon as possible.